Project obstacles and solutions: The Kentucky River near Monterey, KY has a series of locks used in conjunction with a dam. The stretch of river covers 23 miles. The dam and locks were originally built in 1823. Lock #3 was constructed with a timber crib structure, consisting of an outside frame of timbers filled with dirt and rocks. The original lock was stone masonry. This lock had deteriorated over the years and was closed in 2007. 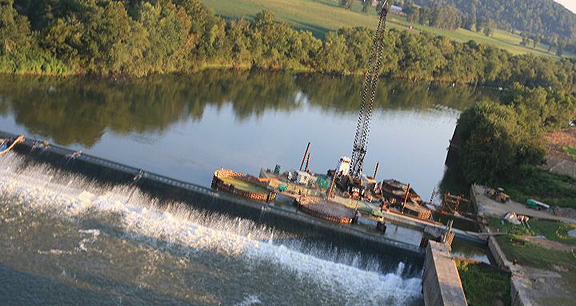 Brayman Construction was hired to repair the lock and spillway on the river. IMI supplied 20,000 yards of concrete in six different mixes. The specialty mixes used in the eight sheetpile cells that span the spillway were mixed with an anti-washout admixture. The river changes depths frequently and strong currents are unforgiving in reconstructing a lock and dam. The precision in placing these products was critical to the overall success of the project. Another challenge came with the logistics. Work on Lock #3 had to be done on both sides of the river. The far side of the job site required a 20 mile drive on poor roads. IMI dedicated 56 trucks to the project, pouring in split shifts from two different concrete plants. They were able to match the quality standard demanded by the project and make sure the flow of concrete was on time to the job site.